These Garlic & Parsley Dough Balls are delicious and extremely addictive. Once you have one you won’t be able to stop! Light and fluffy and covered in delicious garlic & parsley butter. I realised recently that I haven’t made bread for a long time. I love bread, but it isn’t something I make very often. This is because freshly made bread is very hard to resist and between Mr Curly and I we would probably eat a whole loaf in a weekend! My family were coming round for dinner recently and I had decided to make Ravioli Lasagne. 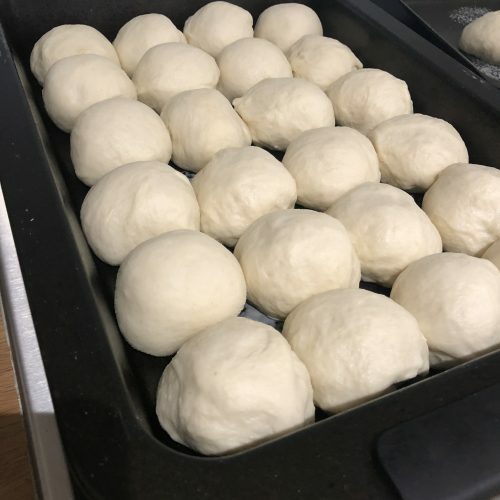 What better to go with an Italian inspired meal than dough balls?! 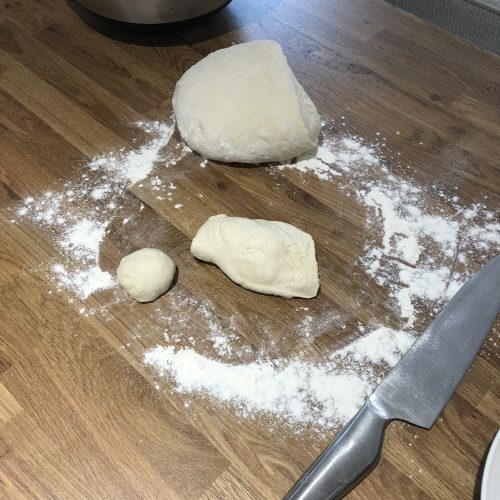 I’d never made dough balls before so at least my family might be kind if the didn’t turn out quite right! 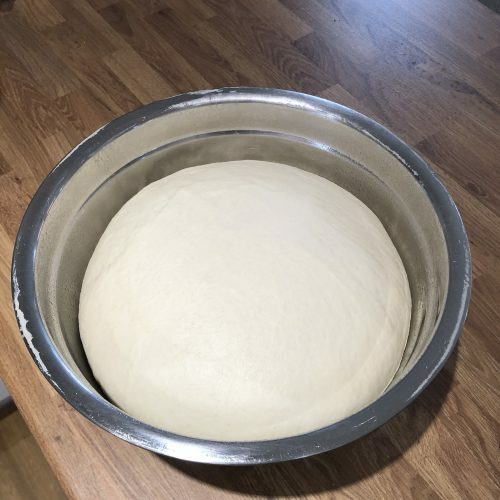 They were coming round for dinner after I’d been at work all day so I didn’t have enough time to make the dough from scratch and let it prove twice. Instead I did what is called a slow prove. I made the dough the night before and left it in the fridge overnight. The fridge dramatically slows down the time dough takes to prove and it can be left proving for 12-24 hours. Don’t leave it longer than this though because it might over prove! All that was left to do the next day was to shape the dough and leave to prove for 30 minutes – just enough time to take the dogs for a walk! The shaping of the dough was where my error occurred. Instead of making dough balls, I made dough rolls. I weighed out each ball to be 50g which was a little large! The final product well and truly got the thumbs up from everyone. The good thing about my family is that they would have given me honest feedback, so if they told me they were good, I know they’re good! The recipe did need a few tweaks though. Obviously the size was a little large, but they also needed more garlic and parsley butter. 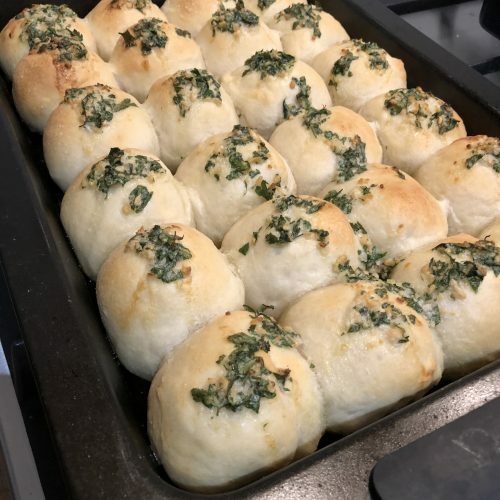 I had a few hours spare the next afternoon…and I had all of the ingredients…so obviously I had to attempt my Garlic & Parsley Dough Balls again! The second attempt was perfect! But obviously I couldn’t keep them in the house because I would have munched them all! So instead I took them round to my sister’s house where my Mum had made a curry. 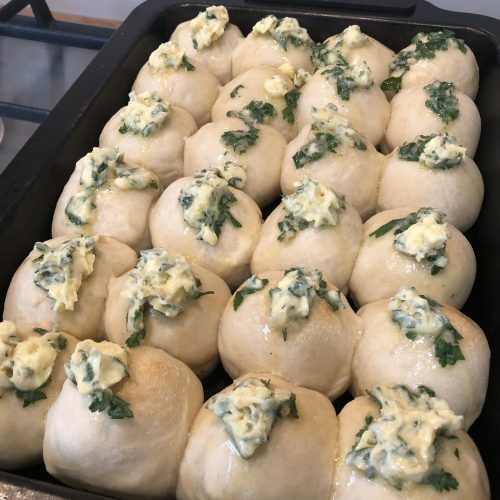 Garlic & Parsley Dough Balls are better than naan bread! I did keep a few back to eat when I got home that evening after a hen do! Anyway, enough of me rambling about how these Garlic & Parsley Dough Balls came about. You need to try these, they are absolutely delicious. So light and fluffy and smothered in the tastiest garlic parsley butter. You’ll make them once and then all you’ll be able to do is think about them. Trust me. 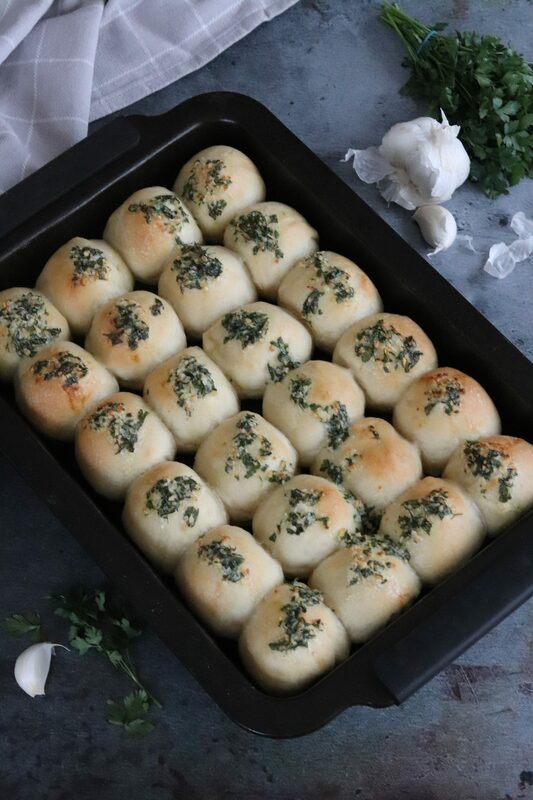 These Garlic & Parsley Dough Balls are delicious and extremely addictive. Once you have one you won't be able to stop! Light and fluffy and covered in delicious garlic & parsley butter. 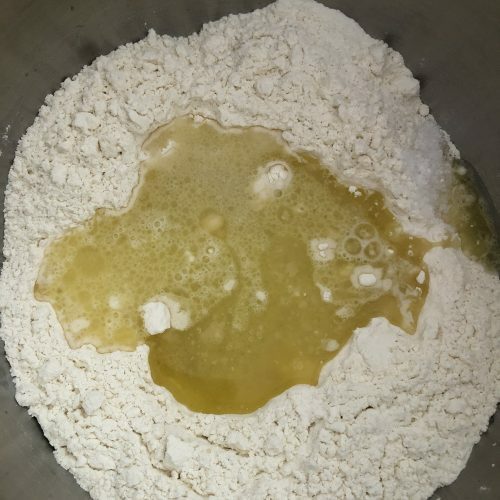 Add the flour, yeast, salt and sugar together in the bowl of your mixer. Make a well in the middle and pour in the oil and water. 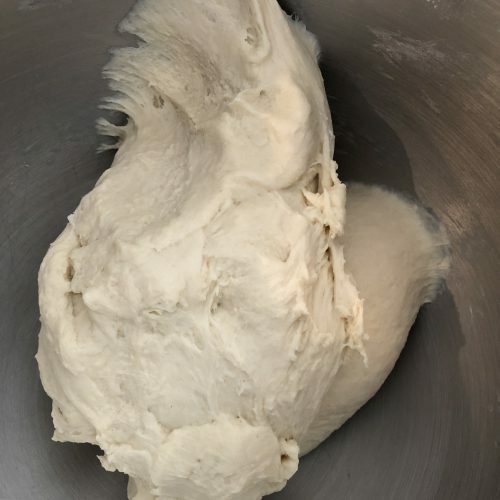 Mix on the lowest speed for 2 minutes using the dough hook. Scrape down the sides of the bowl and the dough hook before adding the rest of the water and mixing for 8 minutes. You may need to stop half way and scrape the dough off the dough hook. 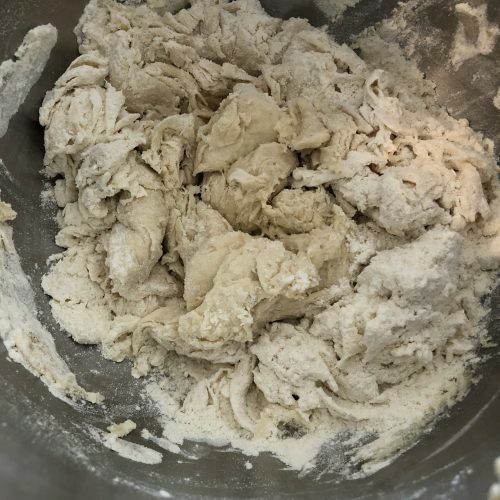 Take the dough out of the mixer and onto a lightly floured surface. Knead the dough a couple of times until the dough is soft and smooth. 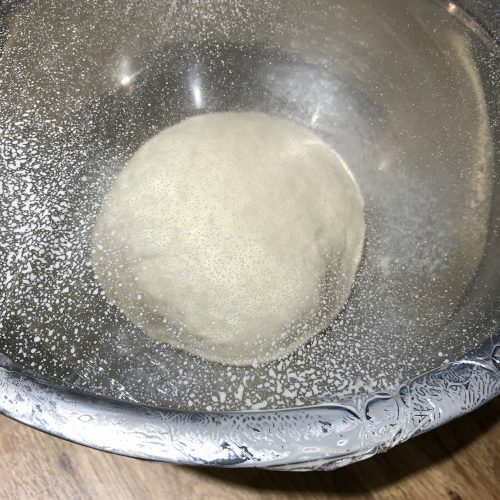 Put the dough in a bowl sprayed with oil and cover with oiled cling film. Leave to prove for 1-2 hours until it has doubled in size. Divide the dough into 30g balls by cutting off sections of dough and rolling them into balls. Line these within 1cm of each other in a oiled roasting tin. This entry was posted in Bread on October 3, 2018 by Curly. These look amazing! 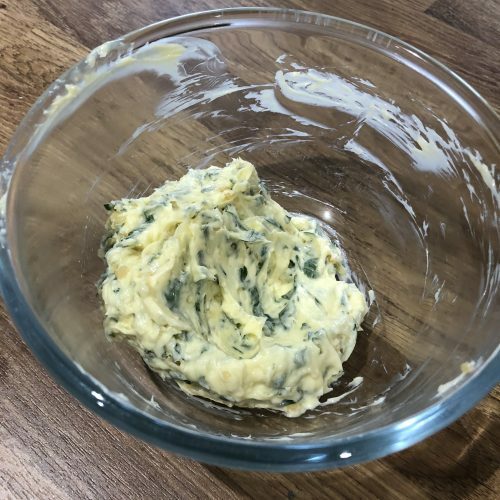 I can’t resist any kind of garlic bread and I’m sure if i made them they wouldn’t last even one day – we’d all be fighting over them! Thanks for sharing with #CookOnceEatTwice! They look so good! I’m dying to make my own garlic bread! Thanks Kat 🙂 Be careful if you do because you might just eat it all! Haha this was exactly my issue. I had to stop myself eating the whole lot! oh these look so so good! I’ll definitely be giving them a try! I love garlic bread in any form! I love everything about these garlicky buns! Perfect for a holiday meal. I would definitely have to share these – I can’t be trusted with homemade bread of any kind. These look and sound fantastic. And I love that you had them with curry too ! They look so pillowy and delicious. I would keep them all for myself! I love garlic.dough balls It made me hungry just reading the recipe. I have never made them myself but from Quejo’s gluten free ones. Haha my mouth waters just thinking about these!